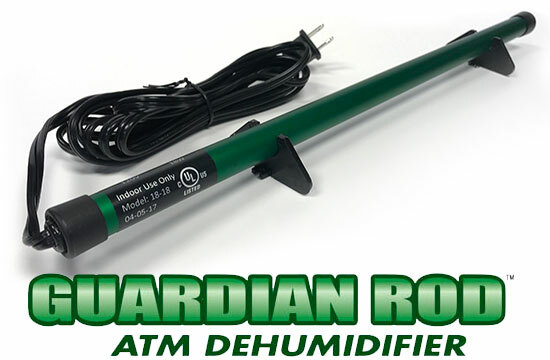 The Guardian Rod is a self-contained heating rod that uses electrical resistance to create warmth inside an ATM. The ATM and the currency inside have a constant gently moving supply of warm, dry air which keeps away corrosion and prevents jams which saves you money! The Guardian Rod is a small self-contained heating rod that sits in the bottom of an ATM and warms the air inside it. It uses electrical resistance to create warmth and is double insulated to keep your currency completely safe. As the air at the bottom of the ATM is warmed, it naturally rises, passing the currency in the cash cassette and eventually finding it’s way out through the myriad of small openings in the upper parts of the machine. As the light warm air exits out through the upper openings, cooler damp air finds it’s way in through the lower parts of the ATM and is warmed by the Guardian Rod. The ATM and the currency inside have a constant gently moving supply of warm, dry air.